, a botanical writer, was born in Silesia in 1709,. and educated for the medical profession. Having a strong bias towards natural history, he was appointed to accompany Hebenstreit in his expedition to the north of Africa, and soon after his return in 1733, became professor of medicine at Leipsic. 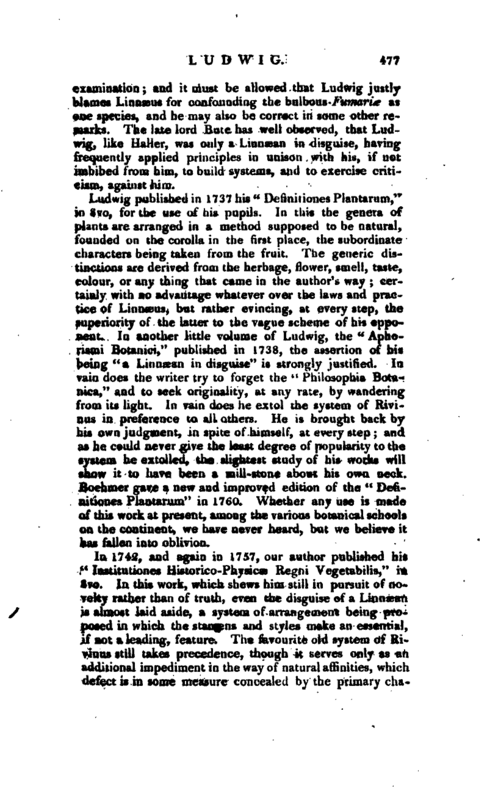 In 1737 be published a “Programma” in support of the doctrine of the sexes of plants, from his own observations upon the date palm, but two years afterwards advanced some objections to the Linnaean system of arrangement by the organs of impregnation, under the title of “Observationes in Metbodum Plantarum Sexualem Cel. Linnaei,” in which he very unjustly attempts to deprive him of the merit of originality, by insinuating that this system had been “indicated by others;” without saying by whom. 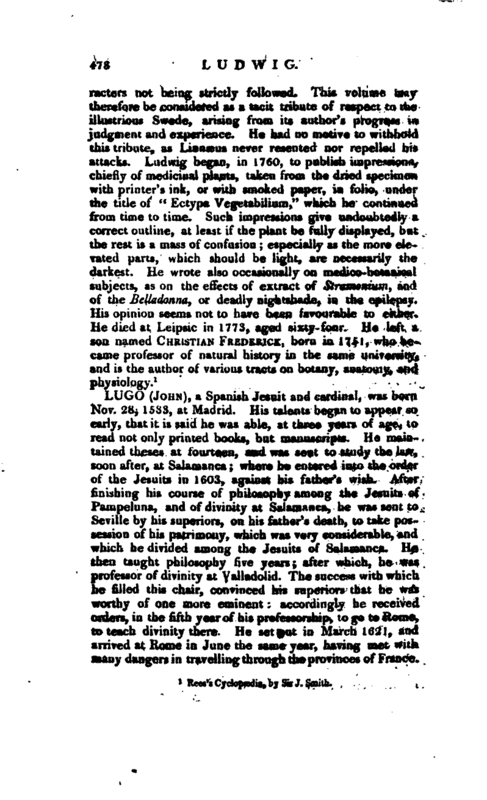 In other dissertations he betrays an uncommon propensity to find fault with Linnæus; but, as his late biographer observes, such critics are useful to science, as they promote inquiry and | examination; and it must be allowed that Lud wig justly blames Linnæus for confounding the bulbous Fumari<e a$ one species, and he may also be correct in some other femarks. The late lord Bute has well observed, that Ludwig, like Haller, was only a Linnasan in disguise, having frequently applied principles in unison with his, if not imbibed from, him, to build systems, and to exercise criticism, against him. Ludwig published in 1737 his “DefinitionesPlantarum,” in 8vo, for the use of his pupils. In this the genera of plants are arranged in a method supposed to be natural, founded ou the corolla in the first place, the subordinate characters being taken from the fruit. The generic distinctions are derived from the herbage, flower, smell, taste, colour, or any thing that came in the author’s way; certainly with no advantage whatever over the laws and practice of Linnæus, but rather evincing, at every step, the superiority of the latter to the vague scheme of his opponent. In another little volume of Ludwig, the “A^horismi Botanici,” published in 1738, the assertion of his being “a Linnsean in disguise” is strongly justified. In vain does the writer try to forget the “Philosophia Botanica,” and to seek originality, at any rate, by wandering from its light. In vain does he extol the system of Rivinus in preference to all others. He is brought back by his own judgment, in spite of himself, at every step; and as he could never give the least degree of popularity to the system he extolled, the slightest study of his works will show it to have been a mill-stone about his own neck. Boehmer gave a new and improved edition of the “Definitiones Plantarum” in 1760. Whether any use is made of this work at present, among the various botanical schools on the continent, we have never heard, but we believe it has fallen into oblivion. 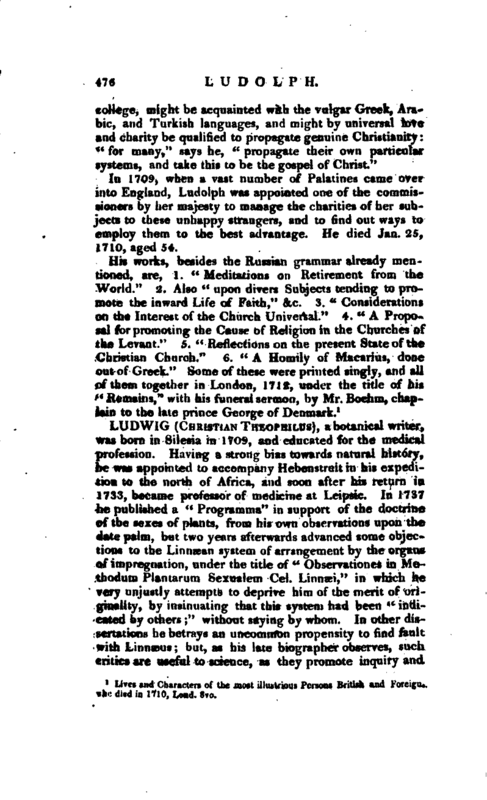 Rees’s Cyclopedia, by Sir J. Smith.